There is provided a combination process for ring opening of aromatics and cycloaliphatics, as well as isomerization of aliphatics using a feedstream comprising hydrocarbons having 6 carbon atoms and at least two reactors connected in series. The first reactor (20) employs a zeolite catalyst and is operated under conditions which particularly promote ring opening. The catalyst in this first reactor may comprise zeolite Beta and platinum. A downstream reactor (40) is operated under conditions to promote isomerization of aliphatics. The catalyst in the second reactor may comprise alumina, platinum and a chloride component. Hydrogen in the effluent of the first reactor (20) may be removed and recycled to the first reactor. Hydrogen required for the second reactor may be satisfied by hydrogen remaining dissolved in the effluent from the first reactor after hydrogen is recycled to the first reactor. '•A gasoline become more stringent. (h) recovering a second stream from the fractionation zone comprising C_ hydrocarbons; and (i) recovering a third stream from the fractionation zone comprising 2,2-dimethylbutane and lower boiling hydrocarbons. Figures 1 and 2 provide schematic representations of embodiments of the present process. Figure 3 provides a graph plotting conversion of C6 cyclics vs. temperature. Figures 4A and 4B provide two graphs. Figure 4A plotting C. cyclics conversion vs. feed LHSV, and Figure 4B plotting C5+ yield vs. feed LSHV. The feedstock for the present process is one which contains significant amounts of C_+ normal and/or slightly branched paraffins. In addition, the feedstock contains monocyclic aromatic compounds and/or cyclic paraffins such as cyclohexane. Among the hydrocarbons having 6 or less carbon atoms in the feedstock, at least 1 wt.%, preferably at least 5 wt.%, more preferably at least 10 wt.%, of these hydrocarbons may be cyclic hydrocarbons, e.g. aromatics or cyclic paraffins. The catalyst composition employed in the first reaction zone comprises a dehydrogenation/hydrogenation metal and a zeolite. The zeolite is to be used in intimate combination with a dehydrogenation/hydrogenation component such as tungsten, vanadium, molybdenum, rhenium, nickel, cobalt, chromium, manganese, or a noble metal such as platinum, palladium or iridium. Such component can be introduced in the catalyst composition to the extent a Group IIIA element, e.g. aluminum, is in the structure, impregnated therein or intimately physically admixed therewith. Such component can be impregnated in, or on, the zeolite such as, for example, by treating the zeolite with a solution containing a platinum metal-containing ion. Thus, suitable platinum compounds for this purpose include chloroplatinic acid, platinous chloride and various compounds containing the platinum amine complex. The amount of the dehydrogenation/hydrogenation component in the catalyst composition can range from 0.01 to 20 weight percent of the composition. A convenient measure of the extent to which a zeolite provides control of access to molecules of varying sizes to its internal structure is the Constraint Index of the zeolite. Zeolites which provide a highly restricted access to and egress from its internal structure have a high value for the Constraint Index, and zeolites of this kind usually have pores of small size, e.g. less than 5 Angstroms. On the other hand, zeolites which provide relatively free access to the internal zeolite structure have a low value for the Constraint Index and usually pores of large size, e.g. greater than 8 Angstroms. The method by which Constraint Index is determined is described fully in U.S. Patent No. 4,016,218. The zeolite of the first reaction zone may be a medium or large pore size zeolite. This zeolite may have a Constraint Index of 12 or less. Zeolites having a Constraint Index of 2-12 are generally regarded to be medium pore size zeolites. Zeolites having a Constraint Index of less than 1 are generally regarded to be large pore size zeolites. Zeolites having a Constraint Index of 1-2 may be regarded as either medium or large pore size zeolites. The members of the class of medium pore size zeolites may have an effective pore size of generally from 5 to 8 Angstroms, such as to freely sorb normal hexane. In addition, the structures provide constrained access to larger molecules. It is sometimes possible to judge from a known crystal structure whether such constrained access exists. For example, if the only pore windows in a crystal are formed by 8-membered rings of silicon and aluminum atoms, then access by molecules of larger cross-section than normal hexane is excluded and the zeolite is not of the medium pore size type. Windows of 10-membered rings are preferred, although, in some instances, excessive puckering of the rings or pore blockage may render these zeolites ineffective. Although 12-membered rings in theory would not offer sufficient constraint to constitute a medium size pore, it is noted that the puckered 12-ring structure of TMA offretite does show some constrained access. Other 12-ring structures may exist which may be regarded to be medium pore sized, and therefore, it is not the present intention to classify a particular zeolite solely from theoretical structural considerations. The above-described Constraint Index provides a definition of those zeolites which are particularly useful in the present process. The very nature of this parameter and the recited technique by which it is determined, however, admit of the possibility that a given zeolite can be tested under somewhat different conditions and thereby exhibit different Constraint Indices. 'Constraint Index seems to vary somewhat with severity of operations (conversion) and the presence or absence of binders. Likewise, other variables, such as crystal size of the zeolite, the presence of occluded contaminants, etc., may affect the Constraint Index. Therefore, it will be appreciated that it may be possible to so select test conditions, e.g. temperature, as to establish more than one value for the Constraint Index of a particular zeolite. This explains the range of Constraint Indices for some zeolites, such as ZSM-5, ZSM-11 and Beta. It is to be realized that the above CI values typically characterize the specified zeolites, but that such are the cumulative result of several variables useful in the determination and calculation thereof. Thus, for a given zeolite exhibiting a CI value within the range of 1 to 12, depending on the temperature employed during the test method within the range of 290°C to about 538°C, with accompanying conversion between 10% and 60%, the CI may vary within the indicated range of 1 to 12. Likewise, other variables such as the crystal size of the zeolite, the presence of possibly occluded contaminants and binders intimately combined with the zeolite may affect the CI. It will accordingly be understood to those skilled in the art that the CI, as utilized herein, while affording a highly useful means for characterizing the zeolites of interest is approximate, taking into consideration the manner of its determination, with the possibility, in some instances, of compounding variable extremes. However, in all instances, at a temperature within the above-specified range of 290°C to about 538°C, the CI will have a value for any given zeolite of particular interest herein of 12 or less. 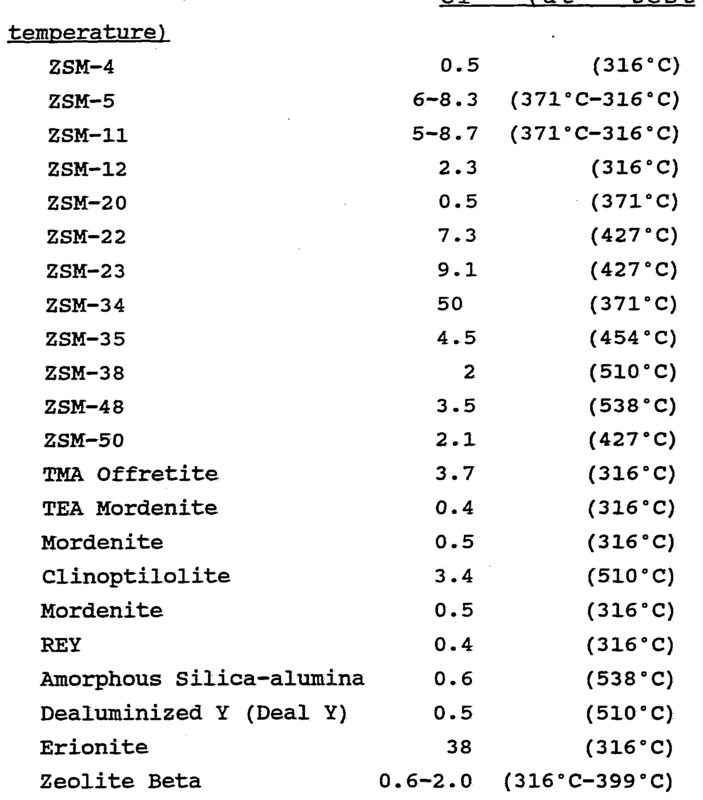 Examples of zeolites having a Constraint Index of from 1 to 12 include ZSM-5, ZSM-11, ZSM- 12, ZSM-22, ZSM-23, ZSM-35, ZSM-38 and ZSM-48. The large pore zeolites, including those zeolites having a Constraint Index less than 2, are well known to the art and have a pore size sufficiently large to admit the vast majority of components normally found in a feed chargestock. ZSM-20. A crystalline silicate zeolite well known in the art and useful in the present invention is faujasite. The ZSM-20 zeolite resembles faujasite in certain aspects of structure, but has a notably higher silica/alumina ratio than faujasite, as does Deal Y. No. 3,923,636, Zeolite ZSM-20 in U.S. Patent No. 3,972,983, Zeolite Beta in U.S. Patent Nos. 3,308,069 and Re. No. 28,341, and low sodium Ultrastable Y molecular sieve (USY) in U.S. Patent NOS. 3,293,192 and 3,449,070. Zeolites with intersecting pore systems, such as Zeolite Beta and Zeolite Y, are of particular interest in the present process. The zeolite crystals can be shaped into a wide variety of particle sizes. Generally speaking, the particles can be in the form of a powder, a granule, or a molded product such as an extrudate having a particle size sufficient to pass through a 2 mesh (Tyler) screen and be retained on a 400 mesh (Tyler) screen. In cases where the catalyst is molded, such as by extrusion, the crystals can be extruded before drying or partially dried and then extruded. It may be desired to incorporate the zeolite with another material which is resistant to the temperatures and other conditions employed in the present process. Such materials include active and inactive materials and synthetic or naturally occurring zeolites as well as inorganic materials such as clays, silica and/or metal oxides such as alumina. The latter may be either naturally occurring or in the form of gelatinous precipitates or gels including mixtures of silica and metal oxides. Use of a material in conjunction with the zeolite, i.e. combined therewith or present during its synthesis, which itself is catalytically active may change the conversion and/or selectivity of the catalyst. Inactive materials suitably serve as diluents to control the amount of conversion so that products • can be obtained economically and orderly without employing other means for controlling the rate of reaction. These materials may be incorporated into naturally occurring clays, e.g. bentonite and kaolin, to improve the crush strength of the catalyst under commercial operating conditions. The materials, i.e. clays, oxides, etc., function as binders for the catalyst. It is desirable to provide a catalyst having good crush strength because in commerical use, it is desirable to prevent the catalyst from breaking down into powder-like materials. These clay binders have been employed normally only for the purpose of improving the crush strength of the catalyst. Naturally occurring clays which can be composited with zeolite crystals include the montmorillonite and kaolin family, which families include the subbentonites, and the kaolins commonly known as Dixie, McNamee, Georgia and Florida clays or others in which the main mineral constituent is halloysite, kaolinite, dickite nacrite, or anauxite. Such clays can be used in the raw state as originally mined or initially subjected to calcination, acid treatment or chemical modification. Binders useful for compositing with the zeolite also include inorganic oxides, notably alumina. In addition to the foregoing materials, the crystals can be composited with a porous matrix material such as silica-alumina, silica-magnesia. silica-zirconia, silica-thoria, silica-beryllia, silica-titania as well as ternary compositions such as silica-alumina-thoria, silica-alumina- zirconia, silica-alumina-magnesia and silica- magnesia-zirconia. It may also be advantageous to provide at least a part of the foregoing matrix materials in colloidal form so as to facilitate extrusion of the bound catalyst component(s) . The reaction conditions in the first reaction zone should be sufficient to cause at least 10 wt.%, preferably at least 25 wt.%, more preferably at least 50 wt %, of the cyclic hydrocarbons introduced into this zone to undergo ring opening. The reaction conditions in the second reaction zone are milder, particularly in terms of lower temperature conditions, to optimize isomerization of paraffins to higher octane value isomers. The theoretical equilibrium concentration of high octane isomers, such as 2,2- dimethylbutane, increases with lower temperature conditions. Thus, high yields of desirable high octane isomers are achievable at lower temperature conditions. In order to use lower temperatures in the second reaction zone, it is preferred to use a catalyst which is more active for isomerization than the zeolite-containing catalyst used in the first reaction zone. Examples of such more reactive catalysts, which may be used in the second reaction zone, include those catalysts described in U.S. Patent Nos. 4,783,575; 4,804,803; and 4,834,866. These catalysts comprise alumina, platinum and a chloride component. 0.1 wt.%, preferably from 0.1 to 1.0 wt.%, more preferably from 0.1 to 0.25 wt.%, of platinum. Other platinum group metals may be present in a concentration of at least about 0.1 wt.%, preferably from 0.1 to 1.0 wt.%, more preferably from 0.1 to 0.25 wt.%. The platinum component may exist within the final catalytic composite as an oxide or halide or as an elemental metal. The presence of the platinum component in its reduced state has been found most suitable for this process. The catalyst of the second reaction zone may also contain a chloride component. The chloride component, termed in the art "a combined chloride", may be present in an amount of at least 2 wt.%, preferably from 2 to 20 wt.%, more preferably from 2 to 10 wt.%, based upon the dry support material. The use of chloride in amounts greater than 5 wt.% have been found to be the most beneficial for this process. There are a variety of ways for preparing this catalytic composite and incorporating the platinum metal and the chloride therein. One method prepares the catalyst by impregnating the carrier material through contact with an aqueous solution of a water-soluble decomposable compound of the platinum group metal. For best results, the impregnation is carried out by dipping the carrier material in a solution of chloroplatinic acid. Additional solutions that may be used include ammonium chloroplatinate, bromoplatinic acid or platinum dichloride. Use of the platinum chloride compound serves the dual function of incorporating the platinum component and at least a minor quantity of the chloride into the catalyst. Additional amounts of the chloride must be incorporated into the catalyst by the addition or formation of aluminum chloride to or on the platinum-aluminum catalyst base. An alternate method of increasing the chloride concentration in the final catalyst composite is to use an aluminum hydrosol to form the aluminum carrier material such that the carrier material also contains at least a portion of the chloride. Halogen may also be added to the carrier material by contacting the calcined carrier material with an aqueous solution of the halogen acid such as hydrogen chloride. It is generally known that high chlorided platinum-alumina catalysts of this type are highly sensitive to sulfur and oxygen-containing compounds. Therefore, the feedstock contacting this catalyst must be relatively free of such compounds. A sulfur concentration no greater than 0.5 ppm is generally required. The presence of sulfur in the feedstock serves to temporarily deactivate the catalyst by platinum poisoning. Activity of the catalyst may be restored by hot hydrogen stripping of sulfur from the catalyst composite or by lowering the sulfur concentration in the incoming feed to below 0.5 ppm so that the hydrocarbon will desorb the sulfur that has been adsorbed on the catalyst. Water can act to permanently deactivate the catalyst by removing high activity chloride from the catalyst and replacing it with inactive aluminum hydroxide. Therefore, water, as well as oxygenates, in particular C.-C- oxygenates, that can decompose to form water, can only be tolerated in very low concentrations. In general, this requires a limitation of oxygenates in the feed to about 0.1 ppm or less. The feedstock may be treated by any method that will remove water and sulfur compounds. Sulfur may be removed from the feedstream by hydrotreating. A variety of commercial dryers are available to remove water from the feed components. Adsorption processes for the removal of sulfur and water from hydrocarbon streams are also well known to those skilled in the art. It has been recognized that cyclic hydrocarbons, especially C cyclics such as benzene, cyclohexane and methylcyclopentane adversely affect the degree of paraffin isomerization over this particular type of alumina/platinum/chloride catalyst. The adverse effect is believed to be caused by preferential adsorption of the cyclic hydrocarbons on the catalyst surface and the resulting exclusion of the paraffinic hydrocarbons. However, the adverse effect is minimized by sustantially removing cyclics in the first reaction zone. Operating conditions within the second reaction zone are selected to maximize the production of isoalkane product from the feed components. Temperatures within the reaction zone will usually range from about 40°C to 180°C. Lower reaction temperatures are • preferred for purposes of isomerization conversion since they favor isoalkanes over normal alkanes in equilibrium mixtures. The hydrogen to hydrocarbon molar ratio in the second reaction zone may be from 0.01 to 10, preferably from 0.01 to 5. However, it is noted that the primary reaction, i.e. isomerization, which takes place in this zone, does not consume net hydrogen. Furthermore, the types of side reactions, preferably saturation of olefins and aromatics, which consume hydrogen, take place primarily in the first reaction zone. Accordingly, the hydrogen to hydrocarbon molar ratio in the second reaction zone may be quite small, preferably 0.05 or less. The pressure in the second reaction zone may be maintained over a wide range of pressures. Pressure conditions range from 50 to 1500 psig. The feed rate to the second reaction zone can also vary over a wide range. These conditions include weight hourly space velocities ranging from 0.1 to 50 hr.-1; however, space velocities between 0.5 and 3 hr. "1 are preferred. When t h e ab ov e - m e n t i o n ed alumina/platinum/chloride catalyst is used, operation of the second reaction zone also requires the presence of a small amount of an organic chloride promoter. The organic chloride promoter serves to maintain a high level of active chloride on the catalyst as small amounts of chloride are continuously stripped off the catalyst by the hydrocarbon feed. The concentration of promoter in the reaction zone is maintained at from 30 to 300 ppm. The preferred promoter compound is carbon tetrachloride. Other suitable promoter compounds include oxygen-free decomposable organic chlorides such as propyldichloride, butylchloride, and chloroform to name only a few of such compounds. The need to keep the reactants dry is reinforced by the presence of the organic chloride compound which may convert, in part, to hydrogen chloride. As long as the process streams are kept dry, there will be no adverse effect from the presence of small amounts of hydrogen chloride. More than one reactor may be employed in each of the above-mentioned reaction zones. The use of two reactors permits a variation in the operating conditions between the two reactors to enhance cyclic hydrocarbon conversion in the first reactor. In this manner, the first reactor Operates at higher temperature and pressure conditions that favor ring opening. The likelihood of exothermic reactions, such as the hydrogenation of unsaturates, occurring in the initial portion of the reaction zone facilitates the use of higher temperatures therein. Once the rings have been opened, the final reactor stage may operate at temperature conditions that are more favorable for isoalkane equilibrium. Another benefit of using two reactors is that it allows partial replacement of the catalyst system without taking the isomerization unit off stream. For short periods of time, during which the replacement of catalyst may be necessary, the entire flow of reactants may be processed through only one reaction vessel while catalyst is replaced in the other. After the feedstock has encountered the second reaction zone, the effluent of the process will enter separation facilities in the recovery of an isoalkane product. At minimum, the separation facilities divide the reaction zone effluent into a product stream comprising C. and heavier hydrocarbons and a gas stream which is made up of lighter hydrocarbons and hydrogen. Suitable designs for rectification columns and separator vessels are well known to those skilled in the art. The separation section may also include facilities for recovery of normal isoalkanes. Normal isoalkanes recovered from the separation facilities may be recycled to the isomerization reaction zone to increase the conversion of normal alkanes to isoalkanes. Typical separation facilities will comprise a stabilizer section that receives the effluent from the reaction and includes at least one stabilizer column. The stabilizer column is operated to deliver a bottoms fraction containing C and heavier hydrocarbons and an overhead fraction of C_ hydrocarbons and lighter boiling compounds. The heavier hydrocarbons recovered from the bottom of the stabilizer column are cooled and may be further separated into a product stream and a reflux stream. C and lighter hydrocarbons taken overhead from the stabilizer column are cooled, condensed and separated into a reflux stream that is returned to the process and a wet gas stream. The wet gas stream enters a scrubber section that contacts the gas with a suitable treatment solution for neutralizing and/or removing acidic components that may have originated with the chloride addition to the isomerization zone and may be present in the gas stream. Figure 1 provides a schematic representation of an embodiment of the present process. Cg+ naphtha enters through line 10 to distillation column 12. 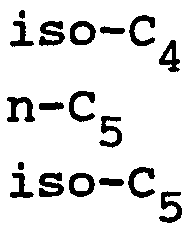 The cg+ naphtha is separated into three fractions: high octane Cg isoparaffins (primarily 2,2-dimethylbutane) which are collected overhead in line 14 and used as a high octane blending component; lower octane Cg paraffins (i.e. 2-methylpentane) and cycloparaffins (i.e. cyclohexane) which are concentrated in line 16; and C7+ hydrocarbons which are sent via line 18 to the reformer. Low octane C paraffins and cycloparaffins are piped from distillation column 12 via line 16 to reactor 20. The Cg cut is mixed with hydrogen stream 56 prior to entering reactor 20. The molar ratio of hydrogen to hydrocarbon in the mixed feed can range from about 5:1 to 0.01:1. Reactor 20 contains a high activity, noble metal-containing zeolite. Reactor 20 pressure can range from 50- 1500 psig, preferably about 450 psig. C + feed rates can vary from about 0.1 to 10 LHSV. The low octane paraffins and cycloparaffins in the Cg cut are partially converted to isoparaffins in Reactor 20. The effluent from Reactor 20 passes through heat exchanger 22 via line 24, and into an isomerization reactor 40 via line 25. Reactor 40 contains an amorphous, chlorided alumina catalyst. Reactor 40 pressure can range from 50-1500 psig, preferably about 435 psig. Feed rates can vary from about 0.1 to 10 LHSV. 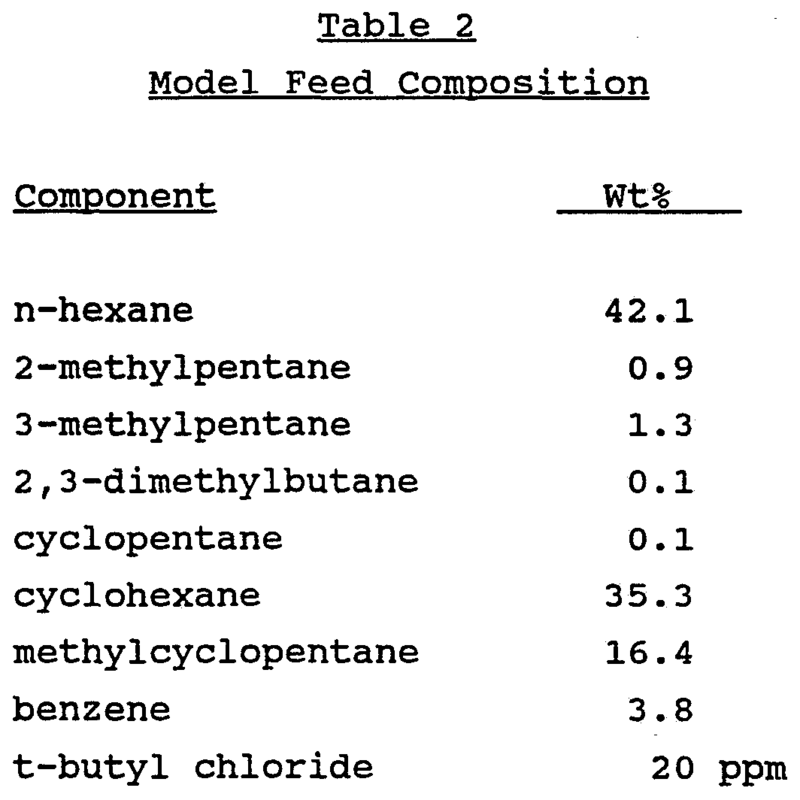 A small amount of organic chloride (10-500 ppm CI on total feed) is injected into the feed prior to reactor 40. Organic chlorides, such as carbon tetrachloride, are needed to maintain isomerization activity of chlorided alumina catalysts. The total effluent from reactor 40 is passed to liquid-gas separator 50 via line 42. Gas in the separator is mixed with makeup hydrogen from line 52 and recycled via line 55 through compressor 54 and line 56 to reactor 20. Recycle gas is a mixture of C - hydrocarbons, hydrogen and chloride promoter. Cg paraffins and cycloparaffins are partially converted to isoparaffins in Reactor 40. The liquid component in the gas-liquid separator is sent via line 58 to distillation column 60. Co_+ hydrocarbons are collected from the bottom of the column and recycled via line 62 to distillation column 12 where high octane isoparaffins are collected overhead in line 14 and used as a high octane blending component. Unconverted Cfi paraffins and cycloparaffins are reacted to extinction by recycling through line 16. Normally gaseous compounds which are soluble in the liquid from the gas-liquid separator 50 (H2, chloride promoter, C.-hydrocarbons) are concentrated at the top of distillation of column 60 and piped to a caustic ' scrubber and/or isobutane recovery facility via line 64. A Cς paraffin stream may be upgraded with this process. The C5 paraffin stream may enter ■ the process prior to reactor 20 and reactor 40. Figure 2 provides a schematic representation of another embodiment of the present process. Coc+ naphtha enters through line 110 into distillation column 112. The distillation column produces three cuts: a high octane blending fraction termed "isomerate" (primarily 2,2- dimethylbutane and lighter hydrocarbons) which is piped overhead via line 114 to the refinery gasoline pool, a C_+ fraction piped from the bottom through line 118 to the reformer, and a cg hydrocarbon fraction which passes through line 116 to Reactor 120. The Cg hydrocarbon fraction contains hexane, methylpentanes, 2,3- dimethylbutane, methylcyclopentane and cyclohexane as the predominant components. The low octane Cg paraffins and cycloparaffins are piped from distillation column 112 via line 116 to Reactor 120. The Cc cut is mixed with hydrogen stream in line 122 prior to entering Reactor 120. The molar ratio of hydrogen to hydrocarbon in the mixed feed can range from about 5:1 to 0.01:1. Reactor 120 contains a high activity, noble metal-loaded zeolite. Reactor 120 pressure can range from 50-1500 psig, preferably about 450 psig. Cg feed rates to Reactor 120 can vary from about .1 to 10 LHSV. The low octane paraffins and cycloparaffins in the Cg cut are partially converted to isoparaffins in Reactor 120. The effluent from Reactor 120 passes through heat exchanger 124 from line 126, and into gas- liquid separator 130 via line 125. The liquid component from gas-liquid separator 130 passes to Reactor 140 via line 132. The feed to Reactor 140 contains only dissolved hydrogen, no make-up hydrogen is added. The gaseous component from gas-liquid separator 130 is recycled via line 131 through compressor 134 and via line 122 to Reactor 120. The recycle gas contains mostly hydrogen with a lesser amount of C.- hydrocarbons. Pure hydrogen can be added to the separator via line 136 to adjust the hydrogen purity in stream 122. Reactor 140 contains an amorphous, chlorided alumina catalyst. Reactor 140 pressure can range from 50-1500 psig, preferably about 435 psig. Feed rates can vary from about 0.1 to 10 LHSV. A small amount of organic chloride (10-500 ppm CI on total feed) is injected into the feed prior to Reactor 140. Organic chlorides, such as carbon tetrachloride, are needed to maintain isomerization activity of chlorided alumina catalysts. Cfi paraffins and cycloparaffins are partially converted to isoparaffins in Reactor 140. The total effluent from Reactor 140 passes through line 142 to distillation column 160. C i_>+ hydrocarbons are collected from the bottom of distillation column 160 and recycled via line 162 to distillation column 112 where high octane isomerate is collected overhead and low octane C,. paraffins and cycloparaffins are reacted to extinction by recycling through line 116. C.- hydrocarbons) are concentrated at the top of distillation column 160 and piped to a caustic scrubber and/or isobutane recovery facility via line 164. A Cj. paraffin stream may also be upgraded with this process. The C5 paraffin stream may enter the process prior to Reactor 120 or Reactor 140. Pt(NH_).Cl_. The exchanged USY was collected by filtration, washed twice with deionized water, and dried at 121°C (250°F) for 16 hrs. The dried catalyst was calcined for 10 hrs in air at 349°C (660°F) . Catalyst properties are given in Table 1. A platinum Zeolite Beta containing catalyst was prepared by calcining a 65%/35% alumina extrudate for 3 hours in nitrogen at 482°C (900°F) followed by 3 hours in air at 538°C (1000°F) . The calcined extrudate was exchanged for 4 hours at room temperature with a 6.62 mM solution of Pt(NH3)4Cl2 in 1.0 N NH4N03. 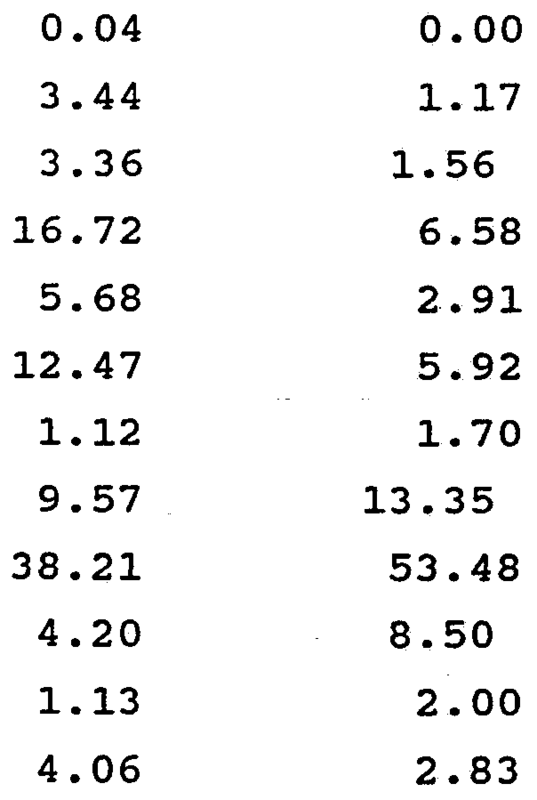 A pH of 9 was maintained throughout the exchange by addition of I N NH.OH. The catalyst was filtered and washed with deionized water until chloride free. The exchanged material was dried at 121°C (250°F) and calcined for 3 hours in air at 349°C (660°F). The final catalyst contained 0.50 wt% platinum. The platinum impregnated zeolites described in Examples 1 and 2 were tested for Cg hydrocarbon ring opening in a micro-unit equipped with a 1/2" downflow stainless steel reactor. In a typical experiment, 10 cc of sized catalyst (14/24 mesh) were loaded into the reactor and reduced in hydrogen at 427°C (800°F) for 2 hours with hydrogen. A hydrocarbon feed with the composition shown in Table 2 was introduced at a rate of 4 vol/vol catalyst/hr with a 2/1 mole/mole H_/HC co- feed. The product from the reactor was analyzed with an on-line gas chromatograph equipped with a 30 meter megabore DB-1 column. Figure 3 shows conversion of Cg cyclics in the model feed as a function of temperature for both Pt/USY and Pt/Beta/Al203 catalysts. At 435 psig and 4 LHSV, the zeolite catalysts showed appreciable ring opening activity (>10%) at temperatures above 260°C (500°F) . Figures 4A and 4B display conversion of Cg cyclics and C5+ yield as a function of feed rate. Conversion of Cc cyclics in the model feed increased at lower feed rates. For instance, conversion of Cg cyclics at 288°C (550°F) with Pt/USY was approximately 55% at 4 LHSV and 95% at 0.5 LHSV. Yield of C5+ product decreased at lower feed rates. However, Pt/Beta/Al203 still afforded 90+% C5+ yield at 80% conversion of Cg cyclics. Table 3 gives product compositions for both catalysts at 288°C (550°F) and 1 LHSV. The C.- product in each case contains predominantly isobutane which can be upgraded to alkylate or MTBE. (b) charging the hydrocarbon product from the first reaction zone along with hydrogen to a second reaction zone, wherein hydrocarbons and hydrogen are contacted with an isomerization catalyst under conditions sufficient to isomerize paraffins. 2. A process according to claim 1, wherein the zeolite is an aluminosilicate zeolite having a Constraint Index of 12 or less. 3. A process according to claim 1, wherein the zeolite is Zeolite Beta. -.•1 hourly space velocity of from 0.1 to 50 hr . 6. A process according to claim 1, wherein at least 10 wt % of the cyclic hydrocarbon rings charged into the first reaction zone are opened in step (a) . (g) recovering a third stream from the fractionation zone comprising 2,2-dimethylbutane and lower boiling hydrocarbons. 'Constraint Index of 12 or less. 9. A process according to claim 8, wherein the zeolite has an intersecting pore system. 10. A process according to claim 7, wherein the zeolite is Zeolite Beta. 11. A process according to claim 7, wherein the catalyst in the first reaction zone and the catalyst in the second reaction zone each comprise platinum. 12. A process according to claim 7, wherein C,- hydrocarbons are cofed into the reaction zone of step (c) . 13. A process according to claim 7, wherein at least 25 wt.% of the cyclic hydrocarbon rings charged into the first reaction zone are opened in step (c) . 15. A process according to claim 14, wherein the zeolite has a Constraint Index of 12 or less. 16. A process according to claim 14, wherein the zeolite is Zeolite Y or Zeolite Beta. 17. A process according to claim 14, wherein the zeolite is Zeolite Beta. 18. A process according to claim 14, wherein the catalyst in the second reaction zone comprises alumina, from 0.1 to 1.0. wt.% platinum, and from 2 to 20 wt % of a chloride component. 19. A process according to claim 18, wherein a chloride concentration of from 30 to 300 ppm is maintained in the second reaction zone. 20. A process according to claim 14, wherein at least 50 wt.% of the cyclic hydrocarbon rings charged into the first reaction zone are opened in step (c) .